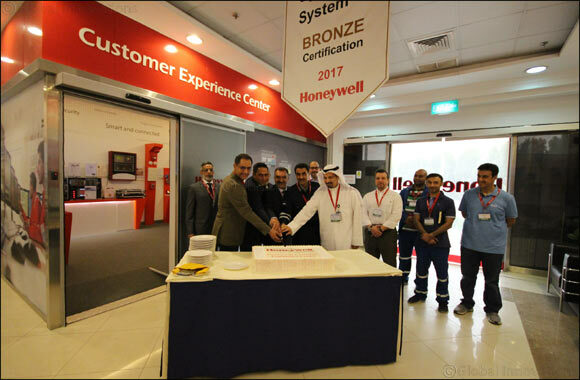 Kuwait, May 15, 2018 – Honeywell (NYSE: HON) today opened a state-of-the art Customer Experience Center (CEC) at its office in Mina Abdullah in southern Kuwait, which aims at giving local customers, trainees and students a deeper understanding of Honeywell products and solutions, in particular Honeywell Connected Plant technology, for oil and gas facilities and refineries. The opening event was attended by senior energy industry executives who experienced how Honeywell leverages the Industrial Internet of Things (IIoT) and connected technologies to increase safety, reliability, efficiency, and profitability across the sector. The launch of the CEC reflects Honeywell’s strategic commitment to the development and advancement of key industries in Kuwait and allows visitors to see, touch and experience a variety of technologies. Together with the Honeywell Automation College in the same location, the facility provides a wide range of training on automation technologies for upstream, midstream and downstream oil and gas environments, and uses real case studies to facilitate learning. The Automation College has been delivering global training capabilities in Kuwait through more than 300 courses specifically designed to address the challenges and future requirements of local power and water, oil and gas, and automation industries. The CEC showcases the latest connected technologies for the oil and gas market, including Honeywell Connected Plant technologies, process control solutions such as the Experion® Orion console, as well as fire, gas detection and cyber security solutions.